For decades, Jacksonville had earned a reputation of being a good football town, hospitable for both college and pro football. Every year the city hosts the Gator Bowl, an annual civic highlight traditionally accompanied by parties, ceremonies, parades and other events leading up to the game. Jacksonville is also host to the Florida–Georgia rivalry, the annual college football rivalry game between the Florida Gators and the Georgia Bulldogs. The Gator Bowl stadium was built out of steel trusses and was frequently built onto, with the final addition of the reinforced-concrete west upper deck coming in 1982. The stadium hosted short-lived teams in both the World Football League (Jacksonville Sharks/Express), American Football Association (Jacksonville Firebirds, a team that coincidentally used the Jaguars name in its earlier years) and the United States Football League (Jacksonville Bulls) and the occasional NFL exhibition game. The city briefly attempted to lure the Baltimore Colts, whose team owner Robert Irsay famously landed a helicopter in the stadium as thousands of Jacksonville citizens urged him to move the team there. City leaders also attempted to get the Houston Oilers to move to Jacksonville at one point in the late 1980s. (At the time, Oilers owner Bud Adams threatened the relocation of the Oilers out of Houston since the Astrodome was not updated until the Harris County Sports Authority responded with a $67 million improvement.) Great efforts were made to lure the Oilers, including the creation of a "Jacksonville Oilers" banner and designation of a specific section of the Gator Bowl as a non-alcohol, family section for proposed home games. Though the efforts proved unsuccessful, it did serve as a launching pad for the city's attempt to gain an NFL expansion team. Jacksonville had long sought an NFL franchise, and in 1989 an ownership group, Touchdown Jacksonville!, organized. The group initially included future Florida Governor Jeb Bush and Jacksonville developer Tom Petway, and came to be led by shoe magnate Wayne Weaver, founder of Nine West. In 1991, the NFL announced its decision to expand the league by two teams, its first expansion since it added the Seattle Seahawks and the Tampa Bay Buccaneers in the 1976 season. Touchdown Jacksonville! announced its official bid for a team, and Jacksonville was ultimately chosen as one of five finalists, along with Charlotte, North Carolina; St. Louis, Missouri; Baltimore, Maryland; and Memphis, Tennessee. For several reasons Jacksonville was believed to be the least likely candidate. Its metropolitan area and television market were smaller than nearly every city with an NFL team. In addition, its stadium, the Gator Bowl, was outdated and the ownership group struggled to negotiate a lease with the city. In July Touchdown Jacksonville! withdrew its bid after failing to come to terms with the city. However, Jacksonville had other assets and a number of strong supporters. It had a very strong football culture, evidenced by the high level of support for the University of Florida Gators and the Florida State University Seminoles, a solid ownership group, and a location in the growing and attractive Southeast region. Supporters included NFL Commissioner Paul Tagliabue, President Neil Austrian, Vice President Roger Goodell, Bud Adams of the Houston Oilers, Rankin Smith of the Atlanta Falcons and Ken Hofmann of the Seattle Seahawks. Encouraged by Tagliabue, Jacksonville interests revisited the issue, and the city agreed to fund $121 million in renovations for the Gator Bowl including sky boxes and club seats. 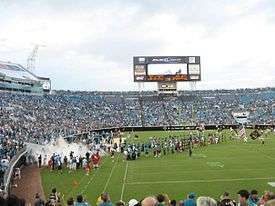 The stadium's 10,000 preferred seats were sold in just ten days, and Jacksonville officially returned to the bidding. Charlotte was awarded the first franchise – the Carolina Panthers – in October 1993. St. Louis was considered the favorite for the second franchise, with Baltimore's three bids also considered strong. However, in a surprising move, the NFL owners voted 26-2 in favor of awarding the 30th franchise to Jacksonville. The 2005 Jaguars' hoped to challenge the Colts for the division title. However, due to their 13-0 start, including two victories against the Jaguars, the Colts were able to easily clinch the AFC South title. With a 12–4 record (second best finish in team history), the Jaguars easily qualified for one of the conference's two wild card playoff allocations. Among these 12 wins were a 23-20 victory over the Cincinnati Bengals on October 9, 2005 and a 23-17 overtime victory over the Pittsburgh Steelers on October 16, 2005. While the Jaguars managed to win key games in 2005, 9 of their final 10 games were played against opponents with losing records. Though these games were wins, key players Byron Leftwich, Mike Peterson, Paul Spicer, and Rashean Mathis were hurt during this stretch. The Jaguars ended the season losing 28-3 to the two-time defending champion New England Patriots on January 7, 2006 in the 2005 season's AFC wild card playoff round. 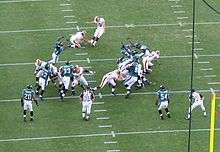 Washington Redskins vs Jacksonville Jaguars in October 2006. On April 28, 2007, the Jaguars used their first-round pick (21st overall) to select Florida safety Reggie Nelson. On June 15, 2007, the Jaguars released longtime strong safety Donovin Darius, who had seen diminished playing time in recent years due to mounting injuries. 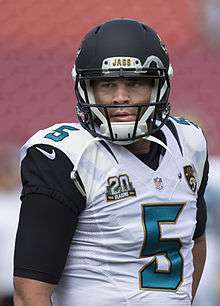 On August 31, 2007, the Jaguars announced that long time back-up quarterback David Garrard would start for the team, ahead of former 1st round draft pick, Byron Leftwich who was released in the team's final roster cuts. 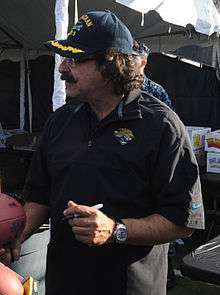 Garrard led the Jaguars to an 11–5 record and the playoffs. On January 5, 2008, the Jaguars defeated the Pittsburgh Steelers 31–29 to win their first playoff game in almost 8 years and their first road playoff win since 1997. It was also the first time in the 50+ year history of the Steelers that they had been beaten twice at home by the same team in the same season. However, in the divisional round, the Jaguars fell to the as of then undefeated New England Patriots; the teams were tied at halftime, but the Patriots pulled ahead and won 31–20. Tom Brady completed 22 of 24 passes in this game, being pressured by the Jaguars' defense only once, on the first play. This game, more than any other, gave the Jaguars' front office a strong desire to upgrade the pass rush during the offseason. The team's offense in 2007 was largely a run-first offense, with Maurice Jones-Drew and Fred Taylor each putting up a lot of yards. David Garrard, however showed to be an accurate passer in 2007, throwing only 3 interceptions. In 2010, to address this issue, the team and the City of Jacksonville undertook several measures aimed at ensuring the franchise's continued viability in Jacksonville. Supporters began the "Team Teal" drive to drum up ticket sales. The city negotiated a five-year, $16.6 million naming rights deal with Jacksonville-based EverBank to rename the stadium EverBank Field. As a result, the Jaguars' attendance increased dramatically in 2010. While attendance figures were stagnant for most of the NFL, Jacksonville saw an increase of 36.5%, by far the highest in the league, and had none of their home games blacked out. ↑ Pierson, Don. "Surprise! It's Jacksonville in NFL landslide". Chicago Tribune, December 1, 1993. Retrieved on January 13, 2015. 1 2 3 Frank Litsky (December 1, 1993). "PRO FOOTBALL; N.F.L. Expansion Surprise: Jacksonville Jaguars". The New York Times. Retrieved May 9, 2012. ↑ "Andersen's Miss Puts Jaguars in Postseason". Chicago Sun-Times. December 23, 1996. Retrieved 2007-11-05. ↑ Allan, Scott (2010-12-21). "Biggest playoff upsets in NFL history". Sports.yahoo.com. Retrieved 2012-09-03. ↑ On, Esteban (2012-01-10). "11 Biggest NFL Playoff Upsets". Totalprosports.com. Retrieved 2012-09-03. ↑ "NFL Top 5: Biggest playoff upsets". Covers.com. Retrieved 2012-09-03. ↑ Marvez, Alex. "Salary Cap Will Just Exacerbate Jags' Problems". Sun-Sentinel. Retrieved January 18, 2013. ↑ "Fred Taylor Retires as a Member of the Jacksonville Jaguars". Retrieved 5 January 2012. 1 2 3 4 Farmer, Sam (December 8, 2009). "Jaguars singing the small-market blues in Jacksonville". Los Angeles Times. Retrieved September 12, 2010. ↑ "2009 NFL Football Attendance". ESPN. Retrieved 22 January 2012. ↑ "Goodell: Jaguars' attendance "a concern"". news4jax.com. Associated Press. February 5, 2010. Retrieved December 16, 2010. ↑ Anderson, Les (September 27, 2006). "A Solution, or Merely a Cover?". Washington Post. Retrieved December 16, 2010. ↑ Stellino, Vito (August 5, 2010). "Jaguars Notebook: Mayor John Peyton encourages fans to buy more tickets". The Florida Times-Union. Retrieved December 16, 2010. ↑ Stellino, Vito (August 2, 2010). "NFL commissioner Roger Goodell still has high hopes for Jaguars' future". The Florida Times-Union. Retrieved December 16, 2010. ↑ Mitchell, Tia (August 10, 2010). "Jaguars now have EverBank Field — and the city's $4 million". The Florida Times-Union. Retrieved September 12, 2010. ↑ Mike Florio (December 1, 2010). "Jaguars see dramatic spike in attendance". profootballtalk.nbcsports.com. Retrieved December 16, 2010. ↑ Jason Notte (December 10, 2010). "Jaguars Avoid NFL Blackout, Bills Face Third". TheStreet.com. Retrieved December 16, 2010. ↑ "Indianapolis vs. Jacksonville". cbssports.com. 2010. Retrieved December 16, 2010. ↑ "NFL Draft 2011". Sports Illustrated. Retrieved August 29, 2011. ↑ Mike Florio (November 29, 2011). "Del Rio out in Jacksonville". profootballtalk.nbcsports.com. NBC Sports. Retrieved November 29, 2011. ↑ Tania Ganguli (November 29, 2011). "Jaguars being sold, Jack Del Rio fired". The Florida-Times Union. Retrieved November 29, 2011. ↑ "Khan era begins". Retrieved 5 January 2012. ↑ Ganguli, Tania. "Jaguars hire Mark Lamping as team president". jacksonville.com. Retrieved 2012-09-03. ↑ Oesher, John. "Tucker, Bratkowski named coordinators". Retrieved 14 January 2012. ↑ Kuharsky, Paul. "Jaguars fire Mike Mularkey". ESPN.go.com. ESPN. Retrieved October 8, 2014. ↑ "Report: 49ers to play Jaguars in London". espn.com. ESPN. Associated Press. October 11, 2013. Retrieved October 11, 2013. ↑ "NFL to hold three games in London in 2014". firstcoastnews.com. 2013-10-08. Retrieved 2013-10-21. ↑ Oehser, John. "Caldwell named Jaguars General Manager". Jaguars.com. Retrieved 19 January 2013. ↑ "Gus Bradley named head coach of Jaguars". Jaguars.com. Retrieved 18 January 2013. ↑ Wesseling, Chris. "Jaguars' Justin Blackmon suspended, will miss season". NFL.com. NFL. Retrieved October 7, 2014. ↑ DiRocco, Michael. "QB Blaine Gabbert dealt to Niners". ESPN.go.com. ESPN. Retrieved October 7, 2014. ↑ Bien, Louis. "Maurice Jones-Drew signs with the Raiders, or: Another sign of hard times for running backs". sbnation.com. SB Nation. Retrieved October 7, 2014. ↑ Hornack, Ken. "After previous draft failures, Jaguars pin future to top picks Bortles, Lee, Robinson". Foxsports.com. Fox Sports. Retrieved October 7, 2014. ↑ Katzowitz, Josh. "Report: Justin Blackmon arrested for marijuana possession". CBSSports.com. CBS Sports. Retrieved October 7, 2014. ↑ Bibber, Ryan Van. "Jaguars unveil world's largest scoreboards at EverBank Field". SBNation.com. sbnation. Retrieved October 7, 2014. ↑ O'Halloran, Ryan. "Final drive stalls as Jaguars finish season 3-13 with loss to Houston". Jacksonville.com. Retrieved January 1, 2015.